During the investigation of most fires, including fatal fires, the investigator is focusing almost all of their attention to the question of cause and origin. This has been the traditional purpose of the investigation. Because of this, the type of smoke detector involved, i.e. ionization or photoelectric, is seldom a factor that is considered important. In fact, in some cases little effort is made to determine if a smoke detector was even present. Complicating the investigation of this aspect of the fire is the fact that quite often the ceilings have been pulled down, along with the remains of the detector in an effort to extinguish the fire. The smoke detector, at least what is left of it is buried in debris and difficult to recognize. In addition the different factors that can affect a smoke detectors ability to detect a fire in time to alert the occupants are not well understood. As a consequence investigators are not away of any reason to investigate the operation of the smoke detector. In this paper I hope to show why investigating aspects of smoke detector performance may be important. If not to the cause and origin of the fire, at least to the cause of injuries and fatalities. In doing this I hope to answer some questions that some investigators have had as to why some detectors may not have gone off in time to alert the occupants. The problem of poor data and information regarding smoke detector operation during fatal fires can be highlighted by a couple of quotes from "Fire in the United States, 1985-19941. In apartments, "Detectors were present and did not operate in 20% of the deaths (30% adjusted). This is 50% higher than the rate of non-working detectors in dwellings. These statistics are unexpected as apartment detectors are more likely to be hard-wired into the electrical system and professionally maintained than detectors in dwellings." "Detectors do indeed make a difference. Yet in 19% of the reported residential fire deaths in 1994, a detector did operate; in 1988, it was 9 percent. In some cases, the detector may have gone off too late to help the victim, or the victim may have been too incapacitated to react. But, the percentage of deaths with detectors present, especially the upward trend is somewhat disturbing since there is a widespread belief that an operating detector will save lives. Further study is needed to show what other factors were involved." Further study is indeed needed. The information needed to study these and other matters that relate to smoke detection and fatal fires must be gathered by fire investigators at the scene. This paper will hopefully aid in that process. I believe that one of the reasons why some people die even though the smoke detector operates is that it operates too late to provide enough time to evacuate. To explain this concern I will have to explain what I mean by "margin of safety". First, let me list three definitions. The time it takes for conditions along the egress route to prevent occupant evacuation. Detection Time + Reaction Time + Travel Time. If detection time, reaction time, or travel time are increased then evacuation time is increased and as a consequence the margin of safety is decreased. If the margin of safety becomes a negative number, i.e. evacuation time is longer than the time before untenable conditions develop, the occupants do not evacuate. An important point to discuss here is that the time to detection is less important than the time of the margin of safety. Under smoldering conditions the time to detection may be much longer than under flaming conditions but the margin of safety may also be larger for the smoldering fire since the time to untenability for smoldering fires is also much longer than it is for flaming fires. Of course, there are also many factors involved with the total time involved with reaction time and travel time that could cause the margin of safety to become negative. Perhaps the detector alarm was not heard. Perhaps the occupant was incapacitated. Perhaps they tried to save valuables rather than evacuate. These are important areas to investigate but they are also pretty well understood by most investigators. This paper will deal with a subject that may not be so familiar. Namely, factors that may cause a detector to operate too late to allow for safe evacuation. An equation that helps illustrate some of the more important factors that affect smoke detector response is listed below. It was originally proposed by Heskestad2 in 1975, and later discussed in a paper by Benjamin3 in 1980.
smoke density in the environment, around the detector, at the time of detector activation. smoke density actually needed inside the detector to trigger the mechanism. characteristic "length" of the detector, which is a way to measure the time that it takes for particles to enter the chamber (smoke entry resistance). velocity of the smoke near the detector. As the rate of smoke build-up, d(Du)/dt, is increased then the amount of smoke in the environment at the time of detector activation, Dur, is increased in comparison to the amount of smoke inside the chamber, Duo. Now I would like to discuss each of the four factors listed above in terms of the impact that they have on the margin of safety, i.e. people's ability to successfully escape a fire. 3. "Aged" smoke, i.e. smoke that has moved some distance away from the fire tends to have larger particles than the smoke from the same fire that is still near the fire. "An ionization smoke detector has a small amount of radioactive material that ionizes the air in the sensing chamber, rendering the air conductive and permitting a current flow the air between the two charged electrodes. This gives the sensing chamber an effective electrical conductance. When smoke particles enter the ionization area, they decrease the conductance of the air by attaching themselves to the ions, causing a reduction in ion mobility. When the conductance is below a pre-determined level, the detector responds." "A photoelectric detector operates on a light scattering principle. They contain a light source and a photosensitive device arranged so the light rays normally do not fall onto the device. When smoke particles enter the light path, light strikes the particles and is scattered onto the photosensitive device, causing the detector to respond." These differences can impact on a detectors response time. As a rule ionization detectors are most sensitive to smaller particles and photoelectric detectors are more sensitive to larger particles. In addition photoelectric detectors tend to show a decreased sensitivity to dark smoke. (This is due to the fact that dark smoke absorbs rather than refracting the light, which the photoelectric detector relies upon.) As a consequence different kinds of smoke will cause different detectors to respond at different levels of smoke inside the detector, i.e. Duo. A chart which graphically displays the changing sensitivities of photoelectric and ionization detectors ionization detectors over the ranges of particle sizes is Figure 16. In Figur12: A represents a photoelectric detector utilizing a "scattered light principle, a spot detector, B represent a photoelectric detector utilizing "obscuration", a beam detector, and C represents an ionization detector, a spot detector. It should also be noted that this chart assumes that the total mass of particulate stays constant for a given volume. This causes the number of particles to decrease as the size increases. It is actually the decrease in the number of particles that cause the ionization detector to become less sensitive to large particle smoke. 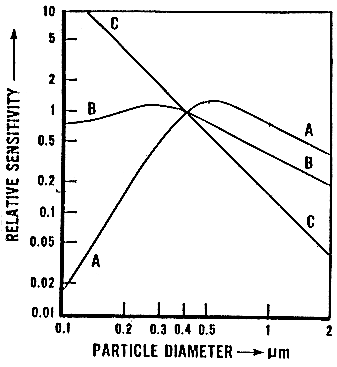 Figure 1 helps illustrate the relative loss of sensitivity of the ionization detector as the average particle size becomes larger or as the number of particles decreases. In fact it reinforces the statement that if you "Double the radius of the average particle you have only one quarter of the effect on an ionization detector".7 In addition it helps explain why an ionization detector that is extremely sensitive to the small particles that are often given off by cooking may not be very sensitive to the larger particles given off by smoldering fires. It also helps illustrate the relative low sensitivity that the photoelectric has to small particles, which helps explain why it is much less susceptible to nuisance alarms than ionization detectors. A chart which graphically displays the changing sensitivities of photoelectric and ionization detectors over the ranges of smoke color is Figure 28. 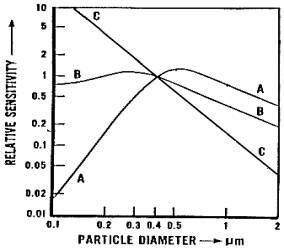 In addition to re-inforcing the information illustrated by Figure 1, the Chart in Figure 2 illustrates the photoelectric detectors relative insensitivity to dark particle smoke. Using the information on Figures 1 and 2, one could conclude that; 1) Ionization detectors are more sensitive than photoelectric detectors to flaming fires, which tend to have smaller particles, and that 2) Photoelectric detectors are more sensitive than ionization detectors to smoldering fires, which tend to have larger particles. This is exactly what Heskestad2 found in his study as indicated in Table 1. Table 1 clearly indicates that detectors can go off at much higher levels of obscuration than the rating on the back, typically 1%-2%, would indicate. For the fire scenarios this is particularly true for the ionization detectors. The photoelectric detectors not only responded to fire scenarios much more consistently but since the time of this study in the mid-seventies the photoelectric detector has improved its response to fires because it has greatly improved its smoke entry characteristics. This factor will be discussed in the next section. "L is a characteristic length scale of the detector geometry (not necessarily related to a physical scale) which certainly may depend on the direction of flow relative to the detector, but is independent of the properties of the smoke. Consequently, L is a quantity characteristic of the detector itself, whereas the characteristic optical density, Duo, depends on the property of the smoke as well as the detector design (including sensitivity setting). … As L increases (entry of smoke to detection chamber becomes more difficult), the sensitivity to the smoke must increase to be able to provide the same type of response." At the time Heskestad was conducting his test, the typical L factors for the detectors in his test were 6ft for the ionization detectors and 20.9-86.7 ft-1 for the photoelectric detectors. Due to changes in smoke detector design and technology these numbers for today's detectors are different. The typical L factors for today's detectors were measured by researchers in Finland in 19929. They were 10.0-12.0 ft-1 for the ionization detectors and 8.5-26.5 ft-1 for the photoelectric detectors. This change in L Factors is important since many of the studies used to justify today's testing and installation standards were conducted with detectors having the old L Factors. This factor is easy to understand. If the environmental obscuration is doubling every 30 seconds as opposed to every 300 seconds, then it just makes sense that there will be a greater discrepancy between Duo and Dur for the fire with the faster rate of smoke production. This increase in the response delay between the environmental obscuration and the internal obscuration the rate of smoke production impacts on margin of safety. In addition to this increasing in environmental obscuration at detection time, the rate of smoke development impacts on the margin of safety in other ways. For any given amount of time, to allow for occupant reaction and egress, a higher rate of smoke development will cause a worse environment during egress than a lower rate of smoke development. Low velocity of smoke flow impacts on a detector's response in two ways. Low velocity smoke flow affects the ease of entry of smoke into the detector chamber. Another way that smoke flow velocity can affect detector response is by impacting on the smoke aging phenomena. By smoke "aging" I am referring to the fact that as smoke particles cool and travel from the fire source they start to "stick together" forming larger and fewer particles.10 The fact that "aged" smoke has fewer particles per unit volume cause the ionization detector to be less sensitive to "age" smoke. This "aging" affect, which is increased at lower velocities, should be accelerated by doorways, which have a creation distance between the ceiling and the top of the door. The time that it takes to "fill up" the upper part of the room of origin before it starts to flow through the doorway will provide extra time for the smoke to "age" relative to a situation where there is a smooth ceiling between the fire and the smoke detector. This should cause detectors, particularly the ionization detector, to have a decreased sensitivity to smoke when the detector is located outside the room of origin. This is often the case since most building and fire codes only require detectors to be located in hallways of residential occupancies. The information presented so far is important in and of itself for an investigator to consider. What I would like to discuss in the next section is a logical syllogism that arises from this information. Smoke from smoldering fires, smoke from fires involving plastics, and aged smoke can be characterized in general as "large particle" fires. Ionization detectors may not operate in time if they have to detect: smoldering fires, fires involving plastics, and "aged smoke fires. "Delayed discovery, typically associated with fires that occur at night when everyone is asleep, also tends to be a characteristic of smoldering fires caused by discarded smoking materials. These smoldering fires are the leading cause of US fire fatalities and detectors are ideally designed to deal with them." Of course one could make a similar conclusion concerning the photoelectric detector and fast flaming fires, but improvements in technology and the short time periods involved in fast flaming fires makes it appear that the data does not support that syllogism. However, there appears to be a lot of data supporting the "ionization syllogism". I would now like to refer to the conclusions of three studies, which seem to support the conclusion in the "ionization syllogism". A study was conducted in 1978 in England12 to study the effectiveness of fire detectors installed in bedrooms and corridors of residential institutions. An illustration of some of the results is Table 2. The smoldering fires were started using a cigarette placed between pads of fibrous cotton upholstery wadding. A polyurethane mattress was covered with cotton sheets. The flaming fires were started with crumpled newspapers, primed with ethanol, that was placed under the side of the armchair nearest the bed. The tests were carried out nominally in still air conditions; but variable low velocity air currents did exist and were observed to affect the flow of smoke to some extent, particularly in the corridor, for smoldering fire, or after flow through cracks. The half-hour fire resistant door assembly, when closed, formed an effective barrier to the heat produced during the complete burnout of the fully furnished room. However, it did not prevent the escape of sufficient smoke to cause rapid smoke logging of the corridor escape route. The precise degree of leakage from the room via all routes is crucial. The velocity stream of smoke from a flaming fire through the cracks in the door was only double that produced by the smoldering fire and door open. This velocity stream is at least an order of magnitude greater if the door is open and the fire is flaming. Under the conditions of ignition from flames, the ionization chamber type detector exhibited a greater sensitivity to the smoke produced than the photoelectric system. However, the rate of generation of smoke was so great that the extra time given by the ionization chamber as a result may be of little practical use. Ionization chamber type detectors, in the room of origin and the corridor, did not, in the smoldering fire tests, provide adequate warning that the escape route was impassable or that conditions in the room were potentially hazardous to life. Photoelectric detectors gave much earlier warning in the smoldering fire tests but those in the corridor did not guarantee sufficient warning of conditions in the room when the door was closed, but did warn of potential smoke logging of the corridor. Photoelectric and ionization detectors sited in bedrooms with the door partly ajar provide adequate detection of smoldering fires only when it originates in the same room, and generally provided poor escape time from smoke originating in other areas of the dwelling. Photoelectric detectors sighted in the hallway are more effective for detecting smoldering smoke than ionization detectors, providing adequate escape time for most conditions of size and location of the smoke sources. Ionization detectors sited in the hallway generally provide inadequate escape times unless smoke movement into the hallway is slowed down by narrow door openings, causing a slower loss of visibility, or unless they are sited close to the smoke source. In 1991 Norwegian researchers14 placed smoke detectors inside and outside the room of origin. The flaming fires were started with a Methenamine, 1588 source. The smoldering fires were started with a glowing cigarette placed on a textile. They reached the following conclusions. The ionization detectors detected smoke from a smoldering fire much later than optical (photoelectric) detectors. When the particular conditions during the fire development are taken into consideration there are reasons to indicate that this detection principle would not provide adequate safety during this type of fire. In many countries like Norway, 90-95% of the smoke detectors installed in homes are ionization types of detectors. Here, smoldering fires are often caused by smoking and those who have installed such detectors are satisfactorily safe providing measures are made to prevent smoldering fires from starting. This means smoking in bed must be avoided. If such homes are to purchase new detectors, the recommendation is that the optical smoke detector is needed. For individual room surveillance, such as in hospitals and hotels, optical (photoelectric) detectors should always be used. Even though these detectors are slightly less responsive when detecting smoke from flaming fires in a room, this time margin should be related to the greater safety optical (photoelectric) detectors provide when smoldering fires occur. The advantage of ionization smoke detectors during flaming fires is only about a 15-20 second earlier warning. This margin will only be decisive for the loss of human life in extraordinary circumstances. Investigators sometimes assume that if these smoke detectors did not respond that there was insufficient smoke early enough that there was insufficient smoke. Investigators sometimes hypothesize that if the smoke detectors did not respond until the smoke reached a dangerous level that the fire must have been growing at such a fast rate that even though it responded quickly the occupants did not have enough time to escape. I know of at least a couple investigators who used this logic to assume that accelerants were involved since the occupants were not alerted until the smoke was already at a level that impeded egress. Investigators sometimes assume that if the occupants could not evacuate safely that the occupants were not able to respond to the alarm. This could be due to the fact that they did not hear the alarm or that they were physically incapable of speedy evacuation. 4. In some cases, investigators assume that there was no smoke detector. They assume that if there had been a working smoke detector that the occupant would have evacuated. This conclusion is often supported by the fact that a smoke detector cannot easily be located due to overhauling. I believe that the basis for these hypotheses, is the assumption that a small amount of smoke will always trigger a smoke detector. This assumption based on the common experience that most people, in which the smoke detector in their home triggers in response to minute amounts of cooking smoke, even cooking odors that are invisible, or steam. In this case, our common sense is misleading, particularly in regards to ionization detectors. As stated earlier, the sensitivity of ionization detectors is inversely related to the size of the smoke particle, assuming a constant mass/volume. Smoke from: fires involving synthetics, fires that start in the smoldering mode, and fires that start remote from the detector, will tend to have larger particles and therefore possible delayed response from ionization detectors. Let me make it clear at this point that I am not saying that these hypotheses are not valid for many fire that are investigated. I just want to point out that they are not the only explanations for detectors not providing enough warning. No hypotheses or conclusions should be made concerning why smoke detectors did not respond in time until the factors discussed in this paper are considered. To properly investigate fires, particular fatal residential fires the investigator should be aware of and consider the types of factors discussed in this paper. They can do this by doing the following. Always collect the involved detector(s) as evidence. If the investigation warrants it can be sent out for testing. Too often the detector involved is destroyed or lost during the overhaul stage of the fire scene. Record the type of the detector. A simple way of identifying ionization detectors is the radioactive symbol or reference to microcuries that might appear on the back of the detector. Consider the location of the detector, relative to the location of the fire. How many doors are between the detector and the fire? Where the doors open or closed? Consider the impact that open windows or HVAC systems might have on the flow of the smoke. If the detector was disabled, consider how close the detector was to potential nuisance alarms. If no survivor is alive to help determine why it was disabled it may be helpful to talk to adjacent apartment or townhouse occupants, who probably have the detectors installed in the same location. To help find the detector it may be helpful to look at adjacent apartment or townhouses. If constructed at the same time or if they have the same landlord there is a possibility that the location of the detector(s) in the adjacent living unit can provide clues to the location in the unit of fire origin. In the absence of the clues it should be assumed that they located where the local codes require them to be located. More than once I have been able to find the detector and the battery in the debris laying on the floor right under the spot on the ceiling where I assumed the detector was located. Even though the plastic had melted the metal parts of the detector were still recognizable. Most of the work of a fire investigator is involved with determining the cause and origin of a given fire. In particular, an investigator must determine if a fire was incendiary. I admit that few of these factors discussed in this paper deal directly with this work. However, while they may not help determine the cause of the fire they could be critical in helping to determine the cause of death or injuries. This information can then be utilized by local or state fire marshals to modify and improve building and fire codes. Without this type of data code officials have trouble justifying code changes. For example, assume that investigators find that in many case a sleeping occupant with a closed bedroom door, either was overcome before the smoke could reach the hallway detector or did not hear the detector in the hallway. This information can be used to justify requiring interconnected detectors in every bedroom. If investigators find that in many cases of smoldering fires that the ionization detector is operating too late or not at all then this information could be used to justify changes in testing and selection of detectors. I hope this information proves useful to those who read this paper. I would appreciate any information that could be provided to me concerning the factors that this paper discusses. National Fire Data Center, "Fire in the United States", 198351994, U.S. Fire Administration, Emmitsburg, Md. 1995. Heskestad, G., Final Technical Report -Escape potential from Apartments Protected by Fire Detectors in High-Rise Buildings, Factory Mutual Research Corp., Norwood, MA, Sponsored by Dept. of Housing and Urban Development, Washington, D.C. (June 1974). Benjamin, I., A., "Detector Response in Large Buildings," Proceedings - Engineering Applications of Fire Technology Workshop, National Bureau of Standards, Gaithersburg, MD, April 1980. Fleming, J.M., "Photoelectric v. Ionization Detectors - A Review of the Literature," Proceedings - Fire Suppression and detection Research Application Symposium, National Fire Protection Research Foundation, Orlando, Florida, February 1998. Moore, W. D., "Automatic Fire Detectors," Fire Protection Handbook, 17th Ed., National Fire Protection Association, Quincy, MA, 1991. Bukowski, Richard, W., "Smoke Measurements in Large and Small Scale Fire Testing," NBSIR78-1502, US Bureau of Standards, Center for Fire Research, Washington, D.C., 1978. Burry, P., "The Principles of Fire detection - Ionization Chamber Smoke Detectors," Fire Surveyor, April 1982, p. 20. Bertschinger, Susan, "Smoke Detectors and Unwanted Alarms", Fire Journal (Jan/Feb, 1988), pp. 43-53. Bjorkman, J., Kokkala M. A., Ahola, H., "Measurements of the Characteristic Lengths of Smoke Detectors", Fire Technology, (May 1992) pp. 99-106. Cable, E., and Sherman, P., "The Ionization Smoke Detector and Smoke Aging," research paper presented to Professor John Titus, Worcester Polytechnic Institute, and Deputy Chief John White, Boston Fire Department, June, 1986. Hall, John, R., "A Decade of Detectors: Measuring the Effect", Fire Journal, (Sept/Oct, 1985), pp. 37-43, 78. R., Riley, K., and Rogers, S., "A Study of the Operation and Effectiveness of Fire Detectors Installed in the Bedrooms and Corridors of Residential Institutions", Fire Research Station, Fire Research Current Paper 26/78, Borehamwood, England, April 1978. Johnson, P., F., and Brown, S., K., "Smoke Detection of Smoldering Fires in a Typical Melbourne Dwelling," Fire Technology, Vol. 22, No. 4, November 1986, p.295. Meland, Oysten, and Lonuik, Lars, "Detection of Smoke - Full Scale Tests with Flaming and Smouldering Fires, "Fire Safety Science," - Proceedings of the Third International Symposium, July, 1991, pp. 975-984. Welker, Roger, W., and Wagner, John, F., "Particle Size and Mass Distribution of Selected Smokes. Effect On Ionization Detector response," Gillette research Institute, Rockville MD, Supported by U.S. Department of the Interior, Bureau of Mines, Pittsburgh Mining and research Center, Pittsburgh, PA, Journal of Fire and Flammability, Vol.8 (January 1977), p. 384-387.